Yazing is simple affiliate monetization platform that any influencer, micro-influencer, blogger or new online promoter can use to earn money promoting valuable money saving deals to any of Yazing’s 1300+ brands. Yazing simplifies the affiliate marketing relationship between you and our brand partners. Here are some ways that you can save time and earn more working through Yazing. You get instant access to all the brands – No need to apply to multiple affiliate networks and individual programs and hope to be accepted into the programs you want, with Yazing, your free account gives you access to promote any of our brands. You get the highest commission rates – Yazing requires that brands offer our members their highest rates in order to get listed and remain on the site. The means you won’t get stuck with the low base commission rates brands typically offer via in their affiliate program. 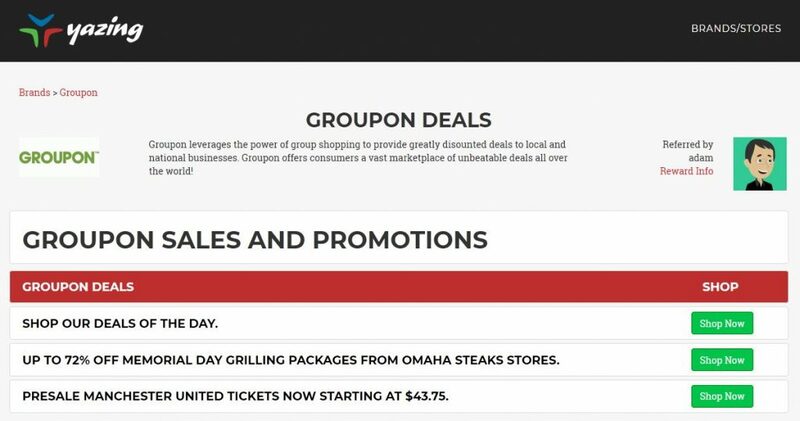 You get the current deals & coupons – Yazing automatically pulls in the latest deals and coupons for each brand every half an hour, insuring that you have the latest promotions available to convert visitors into purchases so you earn commissions. You can stop worrying about dead links – Sometimes brands switch affiliate networks or have deal links that have expired, rendering all of your old links un-monetized. This is a simple change on Yazing’s end and your links to the brand’s deal pages on Yazing remain fresh and current. You can stop chasing payments – Yazing consolidates all your commissions into one easy monthly payment via PayPal. Step 2 – Search the Yazing brand list for a brand you want to promote. The list will show the current commission rates. Step 3 -Click on a “Promote to Earn Button” for easy access to promote on Facebook and Twitter or get a URL for sharing anywhere else. Whenever a shopper comes through your link and makes a purchase, you earn the full cash reward for that transaction! A monetized promotional link is just the brand’s deal page with your member ID added to the end. Here is an example of a Groupon promotional link for my account https://yazing.com/deals/groupon/adam and this is what it looks like when a shopper clicks through: Here you see my profile picture, you can upload your own image in your Yazing profile. When shoppers come through your referral links you earn the full listed cash rewards for any transactions that they make. The shoppers get the listed discounts and money saving coupon codes on their order and you earn the commission on each transaction. As you can see from the example above, when a deal seeking shopper comes through the referral links there are no sign-up or login buttons anymore, it’s just a deal page for the brand you are promoting. Where can I promote Brands to make money? While we have seen members be successful earning commissions promoting timely deals through their standard social media channels and on their blogs, there are a lot of other places where you can post links to drive traffic and make money. We have seen some success with links in postings and comments on online forum sites, online communities, conversational blogs, and news outlets. Just make sure you are following each site or forums terms and conditions on promotional activities. Look for locations where people might be looking for and appreciative of finding coupons and deals from the brands. So remember, Yazing is more than just the best site to earn full commissions on your online purchases, start earning extra income promoting the money saving deals and coupon codes from some of the top online brands today! It really couldn’t be easier! Yazing – Cha-Ching! Next PostNext Yazing Commissions – Who get’s paid for what?